• Trump Administration Doesn't Quite Know What to Do with Martin Luther King Jr.
Trump Administration Doesn't Quite Know What to Do with Martin Luther King Jr. When Martin Luther King Jr.'s birthday rolls around every year, it puts the current iteration of the GOP into something of a pickle. On one hand, he's an icon and an American hero, and his birthday is a federal holiday. On the other hand, most of the modern GOP platform is the polar opposite of what King fought for, particularly when we think about things like educational opportunity, voting rights, and combating discrimination. And that is before we talk about the current administration (and many of its allies), and ongoing efforts to curry favor among those voters whose racial politics belong in a different century. Like, say, the nineteenth. Honestly, you know, the hearts and minds of the American people today are thinking a lot about it being the weekend we are remembering the life and the work of Reverend Martin Luther King Jr. One of my favorite quotes from Dr. King was, "Now is the time to make real the promises of democracy." The Vice President attempted to compare the president to Martin Luther King Jr. Martin Luther King Jr. was a bridge builder, not a wall builder. Martin Luther King Jr. would say: "Love, not hate, will make America great." Presumably, King's own son has a better sense of the man than an ultraconservative 59-year-old white man from Indiana. As noted above, it may not be possible for a member of this administration to honor King without aggravating people. Still, with her somewhat clumsy command of the language, Sanders managed to stick her foot in her mouth. If she had written "devoted his life," or "committed his life," or "dedicated his life," she would still have communicated the sentiment she presumably meant to communicate. However, "gave his life" implies that he willingly died for the movement, in the same way that a soldier "gives his life" for his country. Inasmuch as King was assassinated by a white supremacist, and so most certainly did not die voluntarily or willingly, that verbiage did not sit too well with a lot of people. Actually, if we want to be technical, she made it semi-official. The formal kickoff for her campaign comes next Sunday in her hometown of Oakland. We profiled Harris back in September; you can read that for a fuller biography and commentary on her presidential hopes. However, the central fact of her campaign will be that she was a long-time prosecutor who sent quite a few people to the crowbar hotel. On one hand, that should appeal to centrists and "law and order" types. On the other hand, it's pretty far out of step with a lot of progressive activism right now, particularly Black Lives Matter. According to half a dozen Harris confidants who talked to Politico, she is going to try to massage that by presenting herself as a "progressive" prosecutor who put some very bad people away, but who also showed compassion to those who deserved it. That's a very fine line to walk, especially with a Democratic field that is so crowded. On the other hand, the only other native Californian to become president managed to sell himself to both racial moderates and white supremacists, and to both "end the Vietnam War" and "expand the Vietnam war" voters. So, stranger things have happened. This comes from the New York Post, so take it with a handful of salt. However, they report that Joe Biden, if he runs, is thinking that he would very much like Beto O'Rourke as his running mate. The article does not make clear if they would be a package deal from the outset, or if O'Rourke would merely be Biden's preferred running mate if and when the former VP lands the nomination. On one hand, this is an intriguing pairing, with Biden appealing to the Democratic establishment, to Eastern coastal types, to working-class voters, and to white ethnics, while O'Rourke would presumably connect with young voters, progressives, Southerners, and maybe Latinos—at least as much as an Irishman can. On the other hand, neither of them is actually a dyed-in-the-wool progressive, and they are both male and white. Among the seven or eight major Democratic candidates who have already declared or formed exploratory committees, six are from the progressive wing of the party, five are people of color, and four are women. So, it's hard to believe a white guy-white guy ticket will get it done. Meanwhile, we answered a question recently about Democrats running as a team, and interpreted the inquiry to mean two or three or four candidates running as a sort of "executive committee" that would split up presidential functions. It would appear we misunderstood the question, and were actually being asked about pairs of Democrats forming tickets early in the process (like Sen. Ted Cruz, R-TX, and Carly Fiorina did in 2016) in an effort to get a leg up on the competition. It's possible, but very unlikely. Generally, when aspiring presidents try this, it tends to come off as presumptuous, and is generally a turn-off for voters. Certainly, that's what happened with Cruz/Fiorina (whose campaigns were, admittedly, on life support by then, anyhow). She's not dead, of course. 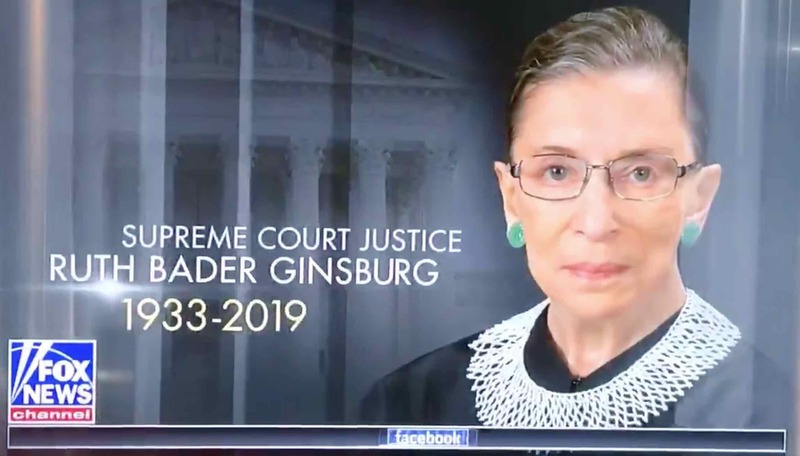 In fairness to Fox, because the 24-hour news cycle does not afford enough time to put together a proper obituary, it is customary to prepare the majority of the necessary material in advance. Many prominent people who are still walking the Earth, particularly those whose time may be running short, have already been memorialized. The New York Times, for example, has around 2,000 pre-written obits at any given time, a practice that occasionally results in a dead person's obit carrying the byline of someone who actually expired before they did (for example, the paper's obit of Elizabeth Taylor, who died in 2011, was written by Michael T. Kaufman, who died in 2010). Still, it would have been less embarrassing for Fox if some random person's death graphic—say, Kirk Douglas, or Prince Philip, or Chuck Yeager—had run, as opposed to the graphic for someone whose actual passing will likely trigger a party in the Fox newsroom. In any case, we mention this primarily because it allows us to talk a bit more about what happens if Ginsburg does not pass, but is also unable to perform the duties of her office. There have certainly been justices who, once they realized they could no longer answer the bell (or, more accurately, the oyez), threw in the towel, even if the president did not share their politics. The most notable recent example is civil rights icon and liberal lion Thurgood Marshall, whose sudden decline and retirement during the George H. W. Bush presidency paved the way for the very different Clarence Thomas to assume Marshall's seat. However, given the manner in which the appointment of justices has evolved, the current 5-4 conservative balance of the court, and Ginsburg's personality, she is not likely to resign while Donald Trump is in office, regardless of how poor her health gets. Roger Taney authored the worst decision in SCOTUS history (Dred Scott), and also engaged in highly improper political negotiations with President James Buchanan related to the decision. That didn't affect his job status one bit, though, nor did the fact that in his final years he was so infirm he could barely walk or write. He stayed on the bench until he died at the age of 87, in a time when being 87 was like being 100 today. James Clark McReynolds was, as we've noted previously, a racist, a sexist, and an anti-Semite who refused to sit for photos with his Jewish colleagues. He was also lazy, often spending only a few hours writing opinions when other justices would spend days or weeks. That was when he could be bothered to show up for work; quite often he cut out to go fishing or hunting. Alfred Moore served on the Court for nearly four years (1800-04), and managed to produce one five-paragraph opinion in that entire time. Similarly, there was Thomas Todd, who served five times as long (1807-26), and managed to produce only 14 opinions. Nathan Clifford needed the paycheck, and so he remained on the court well into his seventies, and after a severe stroke. His capacity was so reduced in his final years that his SCOTUS colleagues referred to him as the "babbling idiot." William O. Douglas also suffered a severe stroke, and was so dysfunctional that his colleagues agreed that they would postpone any case where he was the deciding vote. Frank Murphy spent the last several years of his decade-long tenure going in and out of hospitals. During this time, his clerks and/or his friend Wiley Blount Rutledge wrote most of the opinions that bore Murphy's name. There's also considerable evidence that he became an opioid addict from all the painkillers he was prescribed. William Rehnquist also spent part (and possibly most) of his term with a drug dependency; in his case it was sedatives that sometimes caused him to hallucinate. One can only hope he wasn't hallucinating when he voted to award the presidency to George W. Bush. There is an old joke about lawyers, which we have related before, that asks: "How do you know when a lawyer is lying?" The punchline, of course, is: "His lips are moving." There are quite a number of people in Donald Trump's orbit who barely make headlines anymore for this reason, namely that pretty much everything that comes out of their mouths is a lie. Actually, it's worse than that: Not only do they lie, but then they deny they said anything, or claim to have been misinterpreted, or give whatever other excuse the next day. Kellyanne Conway is in that group of folks, and so are Katrina Pierson, and Sens. Lindsey Graham (R-SC) and Ted Cruz, and even Sarah Huckabee Sanders. It's probably not a coincidence that more than half these folks have law degrees. Rudy Giuliani is dangerously close to getting his membership card in that club. Like Sanders, he is a major Trump spokesperson, so it's awfully hard to just ignore him. On the other hand, nothing that he says is ever allowed to stand; he's constantly denying, or revising, or claiming that everyone misunderstood him. Maybe this is by design, maybe it's because the cheese is slipping off the cracker, maybe it's for some other reason. But in any case, it's getting to the point that listening to him, much less writing or talking about what he said, is becoming a waste of time. My recent statements about discussions during the 2016 campaign between Michael Cohen and then-candidate Donald Trump about a potential Trump Moscow "project" were hypothetical and not based on conversations I had with the President. My comments did not represent the actual timing or circumstances of any such discussions. The point is that the proposal was in the earliest stage and did not advance beyond a free non-binding letter of intent. In theory, the main job of the State Department is to avoid wars with other countries. At the moment, despite being understaffed and largely unpaid, they are doing a good job of it. On the other hand, they haven't been able to avoid an internecine war between Secretary Mike Pompeo and his subordinates. The problems at State date back to the beginning of Donald Trump's presidency. The President's general disdain for diplomacy and international organizations like NATO and the UN have not exactly done wonders for morale. Nor has his failure to fill key posts—the Donald just passed the halfway mark of his first term, and there are still no permanent ambassadors in Egypt, Jordan, Ireland, Cambodia, Saudi Arabia, Pakistan, Chile, Iraq, Malta, or South Africa, among others; a sizable number of undersecretaryships are also unfilled. And then there was the appointment of Rex Tillerson as Secretary; the former corporate CEO did not really have the résumé to justify that hiring decision, and his close-to-the-vest management style was not well suited to a federal agency. So, when Tillerson left last year, the situation was already bad. The choice of Pompeo as his replacement only made things worse, as the Secretary also has a résumé that does not justify the appointment. Further, he shares Trump's isolationism and low regard for the federal bureaucracy and the diplomatic corps. In fact, as a leading tea partier, Pompeo might be even more committed to those viewpoints than the President. The shutdown has brought things to a boil. A great many State Dept. employees are deemed essential, and most of them aren't getting paid. Pompeo, on the other hand, is still drawing a paycheck, and even got a $10,000 raise. That incongruity is pretty grating. On top of that, he's either been thoughtless or deliberately callous towards his underlings, depending on whose interpretation you believe. For example, Pompeo had to travel abroad recently, and he took his wife along with him. That means extra lodging, extra security, extra everything for a non-essential person at a time when the essential people aren't being paid. To take another example, the Secretary insisted on going forward with an after-hours meeting/training session, which put additional work above and beyond the regular duties of staffers who are, once again, not being paid right now. The upshot is that the poor morale of the Tillerson-led department has managed to sink even lower. As one staffer put it: "Unfortunately, the kind of cynical predictions at the outset have proven themselves to be not necessarily cynical but to be perceptive and accurate. Where Tillerson just eschewed the expertise of the building, Pompeo acts like he cares but doesn't actually listen to people or care to." Another predicted mass departures, opining that, "There was damage enough over the last two years. I feel like this was the last straw for a lot of people." Cliff Sims is a former aide in the Trump White House, one whose service lasted roughly 500 days. He's not a well-known name, and by all evidences he was a backbiter and a pretty lousy employee who alienated virtually all of his colleagues and who failed in several attempts to get a security clearance. The one thing he has going for him, though, is that he's willing to spill his guts for a price. So, he reportedly got a seven-figure advance for a tell-all entitled Team of Vipers (a not-so-clever play on Team of Rivals, Doris Kearns Goodwin's book about the Lincoln administration).